John Edward "Hawk" Hawkins. Image available on the Internet and included in accordance with Title 17 U.S.C. Section 107. Under Hawk's Wings Album Cover. Image available on the Internet and included in accordance with Title 17 U.S.C. Section 107. Big Hawk's Gravesite. Image available on the Internet and included in accordance with Title 17 U.S.C. Section 107. HAWKINS, JOHN EDWARD [BIG HAWK] (1969–2006). 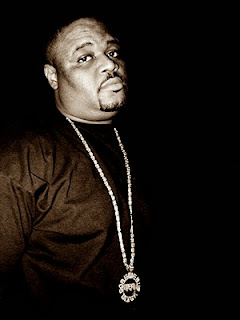 Rap musician Big Hawk was born John Edward Hawkins in Houston, Texas, on November 15, 1969. Big Hawk was a Houston rapper and original member of the pioneering rap group Screwed Up Click. Big Hawk started his rap career in 1994 along with his younger brother, Patrick (known as Fat Pat), and the legendary DJ Screw (born Robert Earl Davis, Jr.). 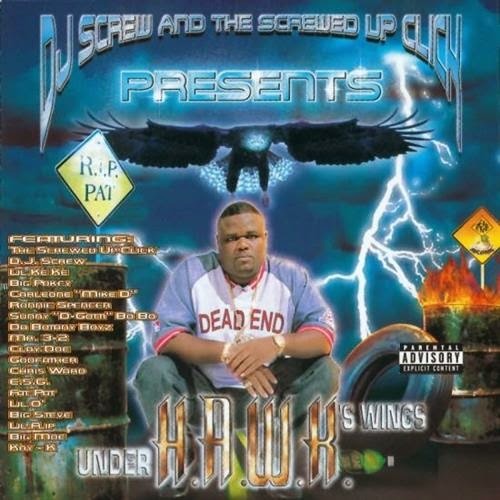 Hawk and other members of Screwed Up Click released their first album Screwed for Life on D.E.A. Records, the label Big Hawk had formed earlier the same year. D.E.A. was short for Dead End Records, which he had named after the dead-end street where he grew up in Houston. Hawk’s best-known songs include “Back, Back” and “Playas Get Chose,” both of which were collaborations with fellow rapper Lil’ O, and a solo hit “Chillin’ Wit My Broad.” Hawk, also known as the “Five-Star General” became the leader of Screwed Up Click, in part due to the deaths of DJ Screw and other founding members. In 2000 he released a solo album, Under Hawk’s Wings, and in 2002 he established the label Ghetto Dreams Entertainment and released a second work, HAWK. Its single, “You Already Know,” reached Number 45 on Billboard’s rap charts. Hawk released Wreckin’ 2K4 with fellow rapper Lil’ Keke in 2003. He was featured on the song “Swang” by Houston rapper Trae in 2005 and recorded a song as a promotion for World Cup soccer in early 2006. Big Hawk advocated non-violence in his music and was known for being an ambassador for Houston rap because of his ability to get along with rappers from all over the area. Big Hawk’s fate was perhaps foreshadowed by the deaths of his brother Fat Pat, who was shot and killed in 1998, and that of numerous other members of the Screwed Up Click, including DJ Screw (drug overdose), Big Mello (car accident,) and Big Moe (heart attack). He was murdered outside the home of a friend on the night of May 1, 2006. He was shot several times and eventually died at the scene. Neither his vehicle nor his possessions were taken, leading police to believe that his murder was not a robbery attempt. A public memorial service for the fallen rapper, held on May 8, 2006, in Houston, drew hundreds of fans. He was laid to rest at Paradise South Cemetery in Pearland just outside of Houston. Big Hawk was survived by his wife Meshah Henderson Hawkins and two sons. His album Endangered Species was released posthumously in 2007. “Big Hawk” Screwston Music.com (http://www.screwstonmusic.com/big-hawk/), accessed June 30, 2010. HAWK Papers, 1998–2006, Courtesy of Special Collections, Houston Hip Hop, University of Houston Libraries. HAWK Photographs and Memorabilia, Digital Library, University of Houston Libraries (http://digital.lib.uh.edu/collection/hawk), accessed September 8, 2015. Houston Chronicle, May 3, 2006. “John Edward ‘Big Hawk’ Hawkins (1969-2006),” Find A Grave (http://www.findagrave.com/cgi-bin/fg.cgi?page=gr&GRid=17976559), accessed June 30, 2010. XXLmag.com, May 9, 2006, “Houston Pays Its Respects to Big Hawk at Memorial Service” (http://www.xxlmag.com/online/?p=1544), accessed June 30, 2010. Handbook of Texas Online, Gregory Sharpe, "HAWKINS, JOHN EDWARD [BIG HAWK]," accessed April 22, 2019, http://www.tshaonline.org/handbook/online/articles/fhake. Uploaded on May 3, 2013. Modified on September 19, 2017. Published by the Texas State Historical Association.